In a matter of minutes, you can have your radios up and running on the Internet with SDR Console Server. Remote SDR listening has never been easier. Give it a try. Simon Brown’s SDR Console is perhaps the most popular software defined radio application. It works with almost all SDR receivers including Perseus, SDRPlay, Airspy, and the RTL dongles. Also supported are transmitting with Apache Labs, HackRF and UHD gear from Ettus Research. Included with Version 2 is the SDR Console Server. Basically, the server lets you enable remote SDR listening in a matter of minutes. If SDR Console supports your radio, SDR Console Server makes it accessible from any Windows computer. 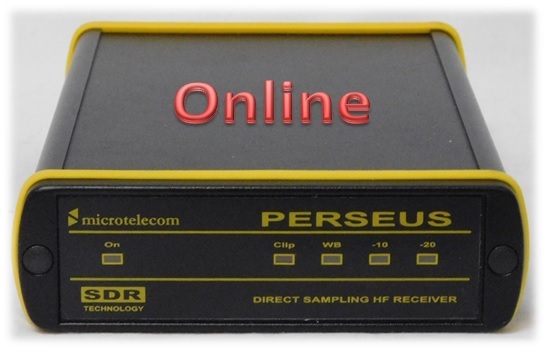 SDR Console Server runs as a service on your PC. Once running, you can access any of your configured radios over the home network or the Internet. For local use, the only real configuration is to make sure the TCP port makes it through your Windows firewall. The software even sets this up for you. Security is provided though creation of accounts and passwords for each user. You can select which of your radios to serve. Even neater, SDR Console Server lets you put your receiver on the Internet for anyone with a password to use remotely. Details about how to use the On-Air feature are available at Simon’s SDRSpace web site. The only tricky bit for public access is that you need to enable Port Forwarding on your home router so incoming data can reach your radio computer. If you want a complete tour of setting up and using the remote server features of SDR Console, take a look at my short video. The computing workload is shared between the server and client computers. As you would expect, the server demodulates the incoming quadrature samples into an audio stream. It also does the FFT to create spectrum display data. Then, the audio and display data is sent over the network. The client PC does display and control, as well as additional DSP when needed. On my computers, both the client and server run at around 2% of CPU load. Depending on how you configure the server, you can tailor performance to your available bandwidth. Mainly, you set up targets for amounts of spectrum display and receiving latency. These are established separately for LAN versus WAN connections. Of course, you also tell the server how much bandwidth to sample and send. The audio codec is pretty smart and generally adjusts itself to network performance. By the way, one you set up Port Forwarding, you do not need to connect remotely through the SDRSpace service. Just enter your public IP address directly. The benefit of using the web service is that you don’t need a static IP. Lastly, SDR Console Server is currently only running as part of the SDR Console Version 2 package. It is not yet enabled in the Preview of Version 3. Fortunately, both versions can run side by side on your radio PC.